Learn how to send AWS Metrics data to Wavefront. Amazon Web Services (AWS), is a collection of cloud-computing services that provide an on-demand computing platform. The Wavefronts Amazon Web Services integration allows you to ingest metrics directly from AWS. The Wavefront Amazon Web Services built-in integration is part of the setup, but the additional steps in this document are needed to complete and customize integration setup. You must have Proxy Management permission to set up an AWS integration. If you do not have permission, the UI menu selections, buttons, and links you use to perform the tasks are not visible. CloudWatch - retrieves AWS metric and dimension data. CloudTrail - retrieves EC2 event information and creates Wavefront System events that represent the AWS events. AWS Metrics+ - retrieves additional metrics using AWS APIs other than CloudWatch. Data include EBS volume data and EC2 instance metadata like tags. You can investigate billing data and the number of reserved instances. Be sure to enable AWS+ metrics because it allows Wavefront to optimize its use of Cloudwatch, and saves money on Cloudwatch calls as a result. For information how to monitor AWS data ingestion, see AWS Integration. You are an administrator for your company’s AWS account. You want to integrate CloudWatch, CloudTrail, and AWS Metrics+ data into Wavefront at the same time. You can use an external ID that is generated by Wavefront. You want Wavefront AWS dashboards. You are not an administrator for your company’s AWS account, but you will be gathering required information from an administrator. You want to integrate CloudWatch, CloudTrail, and AWS Metrics+ data into Wavefront, but not at the same time. You want to use a custom external ID that is generated by your company. You can build your own AWS dashboards. From the page of the integration you select, you can add an AWS integration, enable and disable it, and delete an AWS integration. In Wavefront, click Integrations in the task bar. In the Featured section, click the Amazon Web Services tile. Click Set Up Amazon Integration. Follow the instructions in the right panel to give Wavefront read-only access to your Amazon account. Name - Name to identify the integration. Role ARN - Role ARN from Amazon account. Bucket Name - The S3 bucket containing CloudTrail logs. In your AWS account, go to CloudTrail >Trails to see the bucket name. Prefix - A log file prefix specified when you created the CloudTrail. CloudTrail Region - AWS Region where the CloudTrail logs reside. Click SET UP. The integration is added to the Amazon Web Services Integrations list. If you want to configure whitelists and refresh rate for the CloudWatch integration, click the CloudWatch link in the Types column and follow the instructions in Configuring CloudWatch Data Ingestion. In the row that contains the integration that you want to enable or disable, click the three dots and select Enable or Disable. Select the checkboxes next to one or more integrations and click . In the row containing the integration you want to delete, click the three dots, select Delete and confirm. This tasks explains how to grant Wavefront read-only access to your Amazon account. In your Amazon Identity & Access Management settings, grant Wavefront read-only access to your Amazon account. Select Roles and click Create new role. The role creation wizard starts. Select Role for cross-account access. Select Provide access between your AWS account and a 3rd party AWS account. External ID - External ID generated by your company. On the Attach Policy screen, select the ReadOnlyAccess checkbox and click Next Step. For Role name, enter wavefront and click Create role. Copy the Role ARN value. Select Add Integration > <Integration Option>, where <Integration Option> is Register [CloudWatch | CloudTrail | AWS Metrics+]. Bucket Name - The S3 bucket that contains CloudTrail logs. In AWS, go to CloudTrail >Trails to see the bucket name. Whitelists and Service Refresh Rate - see Configuring CloudWatch Data Ingestion. Click Save. The selected integration(s) are created and added to the Cloud Integrations list. List and Get permissions on the S3 bucket where the logs are delivered. Wavefront retrieves AWS metric and dimension data from AWS services using the AWS CloudWatch API. The complete list of metrics and dimensions that can be retrieved from AWS CloudWatch is available at Amazon CloudWatch Metrics and Dimensions Reference. In addition, you can publish custom AWS metrics that can also be ingested by the CloudWatch integration. In the Types column, click the CloudWatch link in the row of the integration you want to configure. Instance and Volume Whitelist fields - Whitelist instances and volumes by specifying EC2 tags (as <key>=<value> pairs) defined on the instances and volumes. For example, organization=<yourcompany>. When specified as a comma-separated list, the tags are OR’d. 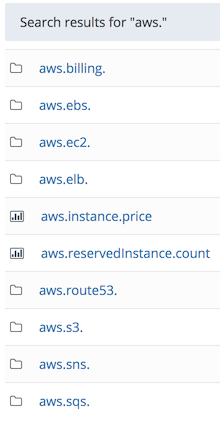 To use instance and volume whitelisting, you must also add an AWS Metrics+ integration because the AWS tags are imported from the EC2 service. If you don’t specify any tags, Wavefront imports metrics from all instances and volumes. Metric Whitelist field - Whitelist metrics by specifying a regular expression. The regular expression must be a complete match of the entire metric name. For example, if you only want CloudWatch data for elb and rds (which come under aws.rds), then use a regular expression such as: ^aws.(elb|rds).*$. If you do not specify a regular expression, all CloudWatch metrics are retrieved. Point Tag Whitelist - Whitelist AWS point tags by specifying a regular expression. If you do not specify a regular expression, no point tags are added to metrics. Service Refresh Rate - Number of minutes between requesting metrics. Default: 5. EC2 - the value of the hostname, host, or name EC2 tags, if the tags exist and you have an EC2 integration. Otherwise, the source is set to the Amazon instance ID. EBS - the Amazon instance ID of the EC2 instance the volume is attached to. All other services - the value of the first CloudWatch dimension. The supported dimensions appear at the bottom of the Amazon service metric documentation topic. For example, see Amazon EC2 Dimensions. AWS sources are assigned source tags that identify their originating service following this pattern: ~integration.aws.<service>, for example, ~integration.aws.ec2. accountId - the Amazon account that reported the metric. Region - The region in which the service is running. 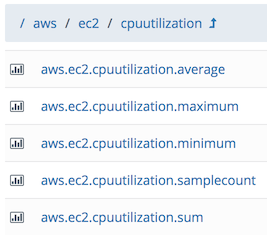 Added to EC2 and EBS metrics only. CloudWatch dimensions. The dimensions vary by service. For example, for AWS S3, the BucketName dimension is added as a point tag. Standard AWS CloudWatch pricing applies each time Wavefront requests metrics using the CloudWatch API. For pricing information, see AWS | Amazon CloudWatch | Pricing. After selecting a region, you can find the current expected price under Amazon CloudWatch API Requests. In addition, custom metrics have a premium price; see the Amazon CloudWatch Custom Metrics section of the pricing page. To limit cost, by default Wavefront queries the API every 5 minutes. However, you can change the request rate, which will change the cost. By default, on a new Wavefront trial, Wavefront limits the number of unique metrics that can be retrieved from CloudWatch to 10K to cap the AWS CloudWatch bill. Wavefront reports the single metric aws.billing.estimatedcharges. The source field and ServiceName point tag identify the AWS services. For the total estimated charge metric, source is set to usd and ServiceName is empty. Wavefront also provides the point tags accountId, Currency, LinkedAccount, and Region. Billing metrics are typically reported every 4 hours. Wavefront retrieves CloudTrail event information stored in JSON-formatted log files in an S3 bucket. The CloudTrail integration parses the files for all events that result from an operation that is not a describe, get, or list, and creates a Wavefront System event. Starting with release 2018.22.x, we group AWS CloudTrail events by the minute and report the metrics. We also support several point tags that allow you to filter the events. Each metrics starts with aws.cloudtrail.event., followed by one of the EC2 operation names. As a result, the metrics include, for example aws.cloudtrail.event.Start or aws.cloudtrail.event.CreateTags. In addition, the metric aws.cloudtrail.event.total-per-minute reports the per-minute count of all AWS API calls recorded by the AWS CloudTrail integration. You can use the following point tags to filter the metrics. aws.instance.price - EC2 instances and how much they cost per hour. This metric includes the point tags availabilityZone, instanceID, instanceLifecycle, instanceType, and operatingSystem. aws.reservedinstance.count - Number of reserved instances in each availability zone by each instance type. This metric includes the point tags availabilityZone, instanceID, instanceType, and operatingSystem. This metric appears only if your account has reserved instances. EBS metrics - EBS metrics include the point tags instanceID, Region, State, Status, volumeId, and volumeType (see Amazon EBS Volume Types). The Status can be attached, detaching, or attaching. The State can be available (detached) or in-use (attached). aws.ebs.volumesize - The volume size of the elastic block store. aws.ebs.volumeiops - The volume I/O operations of the elastic block store. SQS - AWS SQS metrics retrieved every minute from the SQS service. aws.sqs.approximatenumberofmessagesnotvisible - The number of messages that are “in flight.” Messages are considered in flight if they have been sent to a client but have not yet been deleted or have not yet reached the end of their visibility window. aws.sqs.approximatenumberofmessagesdelayed - The number of messages in the queue that are delayed and not available for reading immediately. This can happen when the queue is configured as a delay queue or when a message has been sent with a delay parameter. aws.sqs.approximatenumberofmessages aliased to the CloudWatch metric aws.sqs.approximatenumberofmessagesvisible - The number of messages available for retrieval from the queue. Pricing Metrics - capture the current pricing of EC2 instances. These metrics are available as a preview and subject to change. These metrics have the point tags instanceType, operatingSystem, Region, purchaseOption (All Upfront, Partial Upfront, No Upfront), leaseContractLength (1 or 3 years), and offeringClass (standard or convertible)). The source field is set to the display name of the region. For example, if Region=us-west2, then source=us west (oregon). ~sample.aws.ec2.on-demand.price.hourly - the hourly price (in US$) of an on-demand instance. ~sample.aws.ec2.reserved.price.upfront - the up-front payment (in US$) for a reservation. This metric reports 0 when purchaseOption is No Upfront. ~sample.aws.ec2.reserved.price.hourly - the hourly payment (in US$) for a reservation. This metric reports 0 when the purchaseOption is All Upfront. If you set up an Amazon Web Services integration, Wavefront installs AWS overview dashboards Summary, Pricing, and Billing and the AWS service-specific dashboards: EC2, ECS, ELB, DynamoDB, Lambda, and Redshift. All AWS dashboards have a tag ~integration.aws.<service>. For example: ~integration.aws.ec2, ~integration.aws.lambda, etc. Note: System dashboards are read-only so they can be easily updated. If you want to make your own version of a system dashboard, you can clone the system dashboard and make changes to the clone. If you have a dashboard with the same URL as a system dashboard, Wavefront saves the dashboard with "-clone" added to the URL and "(Cloned)" added to the name. In the Dashboards page, system dashboards are indicated with a next to the dashboard name.